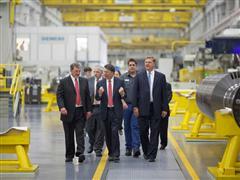 From left: Mark Pringle, vice president Siemens Charlotte, Pat McCrory, governor of North Carolina and Eric Spiegel, president and CEO Siemens Corporation, tour the Siemens plant during an event Wednesday, September 24, 2014 at the Siemens Charlotte Energy Hub in Charlotte, NC. Siemens is providing a $32 million in-kind software grant to Central Piedmont Community College to educate and train workers for the manufacturing industry. This academic partnership will help North Carolina prepare a highly skilled workforce necessary to take advantage of a manufacturing resurgence in America.